Ecology Ottawa wants our city to be the green capital of Canada, with bustling urban hubs connected by world class public transit. Light rail transit (LRT) is one of the most effective ways to make this vision a reality. It’s an efficient way of connecting people with the places they need to go while lessening costly congestion and reducing greenhouse gas emissions. By last spring Ecology Ottawa collected close to 2,000 signatures on a petition calling for the expansion of light rail to the east, west and south ends of the city. Since its launch in 1983, Ottawa’s Bus Rapid Transit system (BRT) has become one of the more effective, but also overburdened, transit systems in Canada. Ottawa residents take transit on average 125 times per year; a greater proportion of people than in any other city of comparable size in North America. But Ottawa’s transit needs are no longer what they were in 1983. By 2031, the city’s population is expected to grow by 30 percent, with 68 percent of new residents – and 42 percent of new jobs – located outside the Greenbelt. Along with this population growth, transit ridership is expected to increase by 76%, from 93 million to 164 million trips annually. Something new and substantial is needed to accommodate this growth, and that’s where light rail comes in. Ottawa’s LRT plan is divided into two phases. Phase 1, from Blair Station to Tunney’s Pasture using a 2.5 km-long tunnel, is scheduled for completion in 2017. Phase 2, slated for completion by 2023, will extend as far as Bayshore in the west, Bowesville in the south and Place d’Orleans in the east. In Ontario as well as other provinces across Canada, large-scale infrastructure projects are routinely supported by all three levels of governments because of the amount of funding they entail. The municipal tax base and transit fares are not sufficient on their own to create an entirely new transit system. Far from merely replacing buses, Ottawa’s new LRT system would dramatically scale up the city’s public transportation capacity. For example, without the LRT tunnel, Ottawa would have to have articulated buses travelling through the downtown core once every 18 seconds in order to meet the transit demand projected by 2031. With LRT, transit demand is met and expanded upon in the short- and long-term. Phase 1 would increase transit ridership by 4.6 million new trips in the first year alone. Once completed, Phase 1 would mean an estimated 40% of transit trips in the city would incorporate light rail. More public transit leads to remarkable environmental benefits. The reduction in CO2 emissions that can be expected would, in the long term, be near 94,000 tonnes. This is the equivalent of planting 9.4 million trees. In the first year alone, the effects of the light rail would match the removal of 6,500 medium-sized vehicles from roads. Also, the LRT will not merely shift carbon emissions from one place (cars/buses) to another (power generation). In keeping with Ontario’s Renewable Energy Initiative, the massive project will be powered primarily by renewables. Other benefits would include 5,600 tonnes saved in road salt; a billion or so dollars saved by 2031 in vehicle operating costs; and approximately $400 million saved from accident avoidance. 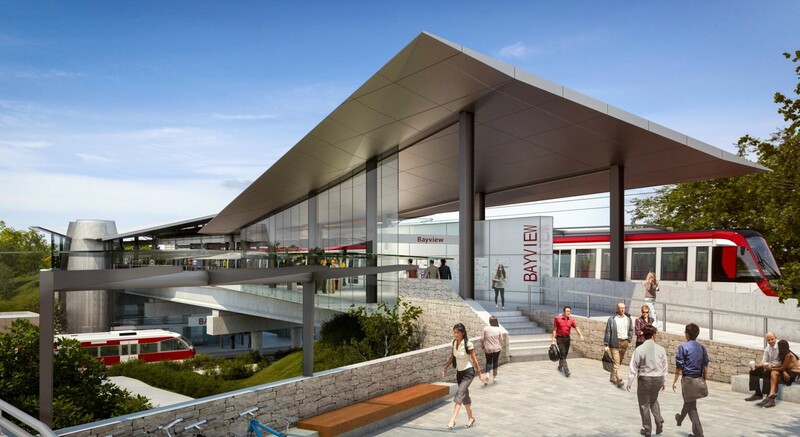 Ottawa’s LRT will not only bring environmental and economic savings; it will accommodate the needs of suburban workers and effectively generate jobs and revenue. The overall money added to the economy from employment benefits alone could top $3 billion. The statistics and benefits projected here may sound like optimistic estimates, but if anything they’re conservative judging by historical example. Ecology Ottawa believes that efficient public transit is essential to the greening of any modern city, and that Ottawa’s LRT plan is a viable and practical way to meet the city’s transportation needs while helping the planet at the same time. City of Ottawa (2012). Transforming our Nation’s Capital: The Benefits of Light Rail. Retrieved July 7, 2014 from: http://www.confederationline.ca/wp-content/uploads/2013/03/The-Benefits-of-Light-Rail-Web.pdf. not necessarily. from orleans theres alot of people who work over in hull. currently taking the 234 for example gets you from place d’orleans to place du portage directly. presumably under the new LRT system we would have to take a bus to the LRT at blair, then the LRT to somewhere downtown, then a bus across to place du portage. so two transfers instead of none. not so convenient for that. the ONLY way i see this as resolvable is if they leave the “east end to hull” bus(es) intact as is. so reduce the buses that go downtown ,convert them over to milk runs from orleans and area to the LRT and back(making them more available) but leave as above example the 234 in place but have it go from orleans to portage without downtown stops (or less stops downtown). even if they left the 234 exactly as is it would be fine to. This talks about the ‘green’ aspects of the LRT. This would apply to Phase 1. BUT Phase 2 will be based on diesel trains. Phase 2 of the Confederation Line will be electric, the same as Phase 1; Nobody’s going to be jumping out of a diesel LRT into an electric LRT at Tunney’s!! The Trillium Line is diesel-powered, but the current trains are convertible to electric, and the new construction work is all being done to include space for catenary and eventual electrification. And, even before that, the amount of diesel used per passenger-km is far lower in a diesel LRT than in a diesel bus.